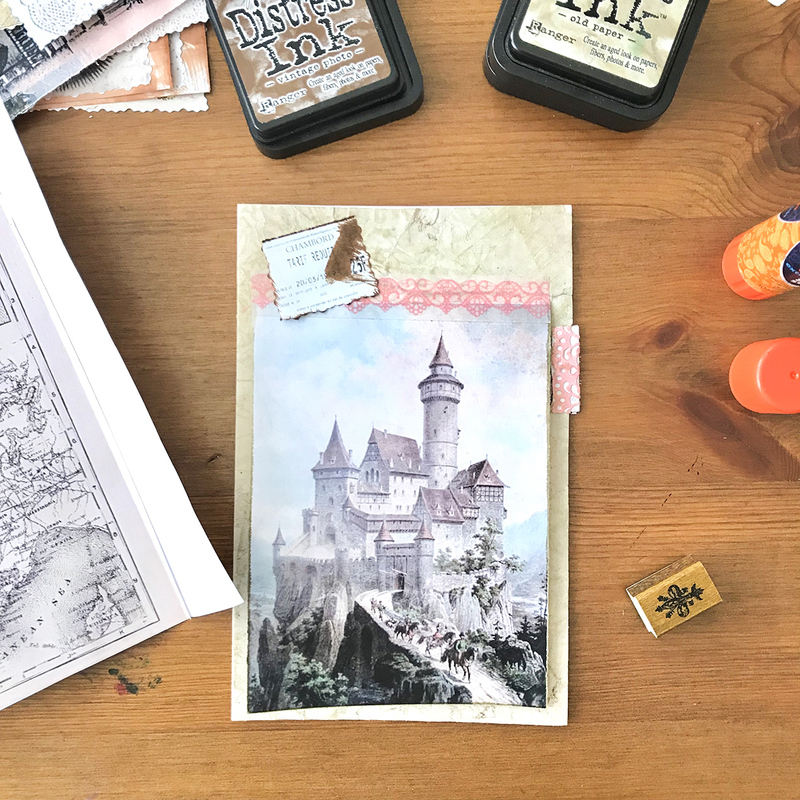 Today we have new junk journal page layouts and easy techniques as our ‘Vintage French Junk Journal’ journey visits the castles of France. 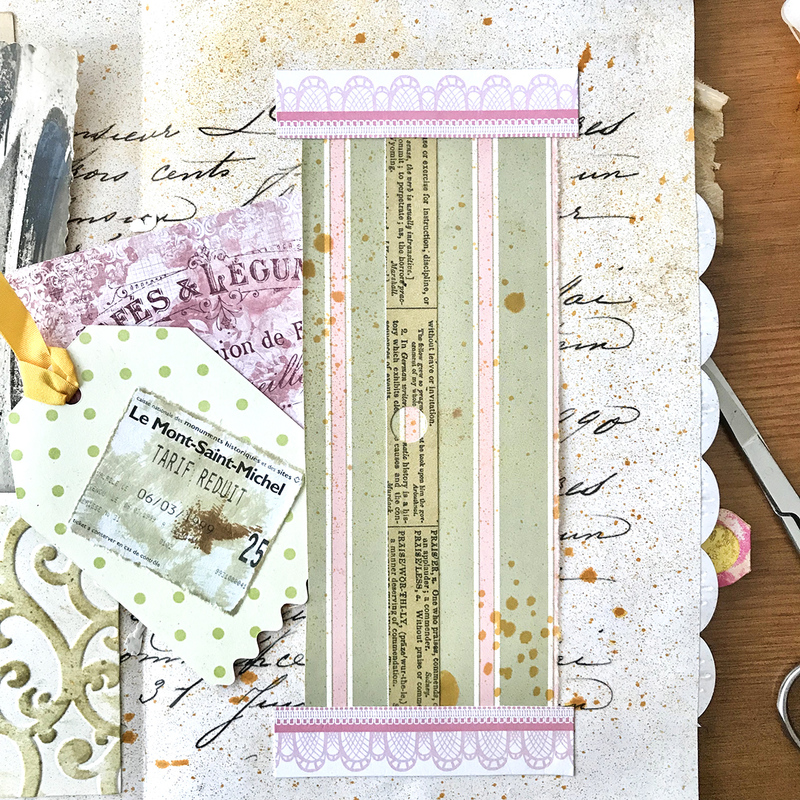 In this lesson, we will explore junk journal tip, flap, tab, and trap elements as we start our third and final signature. If you missed the first tutorials in the series, I recommend that you work through them before attempting this tutorial. 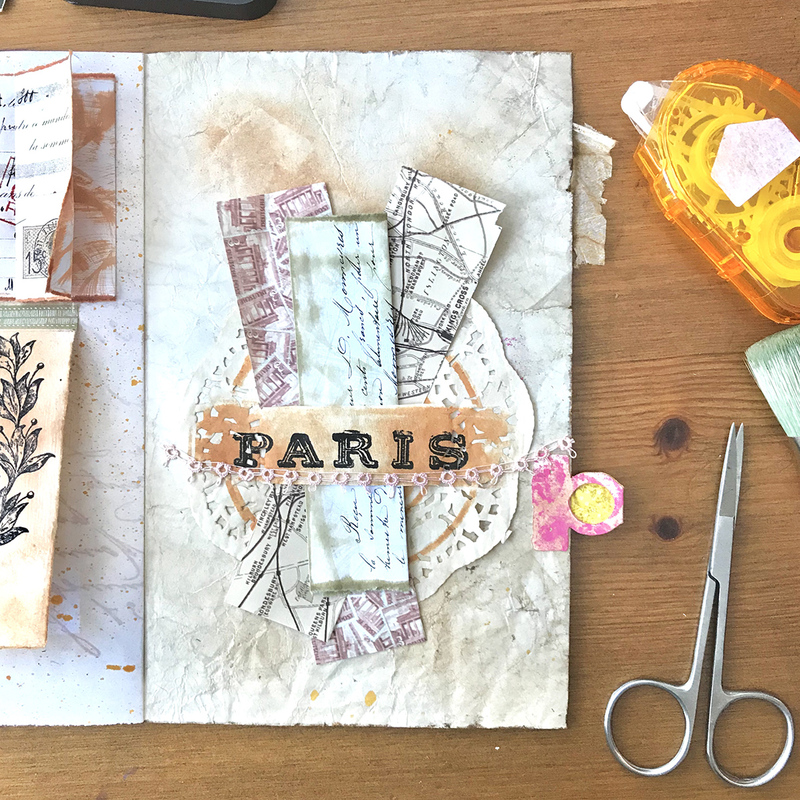 You can find them here –>>> The Junk Journal Introductory Tutorial, –>>>Page Layouts 1, –>>>Page Layouts 2, –>>>Page Layouts 3, and –>>>Page Layouts 4. 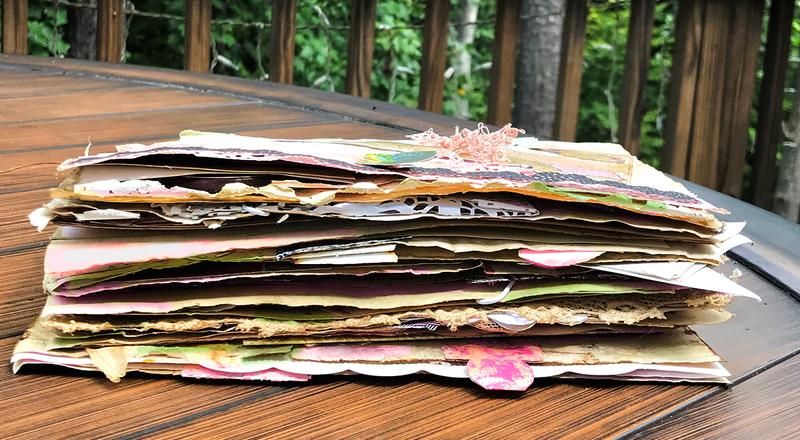 My fondest wish is that you are developing your own ‘creative language‘ during this hands on, experiential series of book making techniques with a nod toward mixed and altered media. 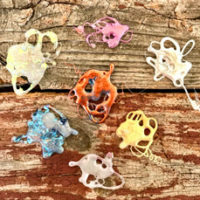 Found materials, pieces of your stash, and inventive applications of mixed media processes and techniques are all part of the journey, and is what will make each book unique and personal to the creator. We will be taking a little different track this week. It is time for you to begin exploring your one wild, wondrous imagination. 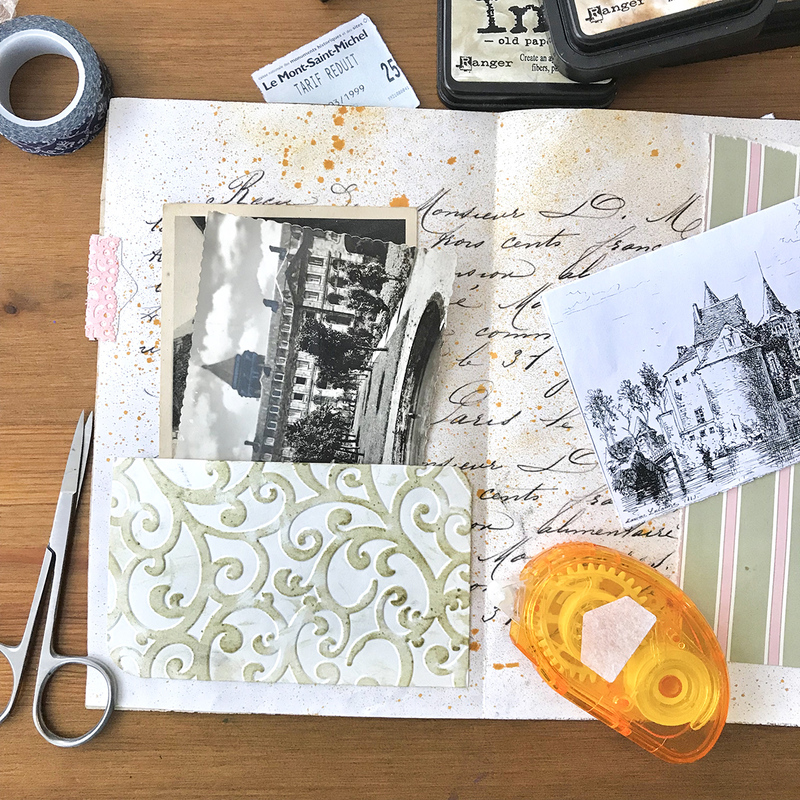 In this tutorial we will be using the Basic Supplies from Page Layouts 1, plus found objects from our kitchen and stash. I use Distress Ink Old Paper for aging pages and edges of almost everything, but sometimes I use other colors. 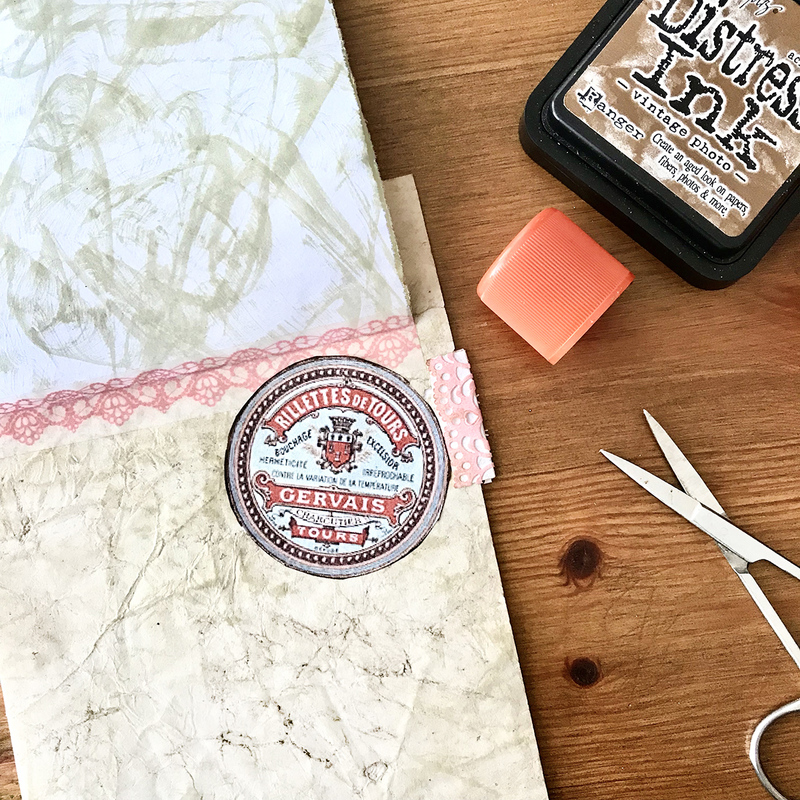 I also use old stickers, paper, tickets from my stash, lace edging and ribbon, rubber stamps, stencils, and paints and potions this time. Create yours with thoughtfulness. 🙂 Please feel free to use different images that suit your style more closely. Anything goes in this series. With any learning experience, there comes a time when the instructor must allow the student to make their own way with the newfound knowledge and skill set. We are just about at that moment. We have four new techniques, along with some random ones to explore, and we will use some of our previous techniques to flesh out the first 8 pages of the final signature. It is almost time… We will be finishing this signature in the next tutorial, then we will embellish and bind everything together in the final two tutorials of this series. This time we will turn one folio (4 pages or one sheet of paper folded in half) into 8 pages. How will we do that? 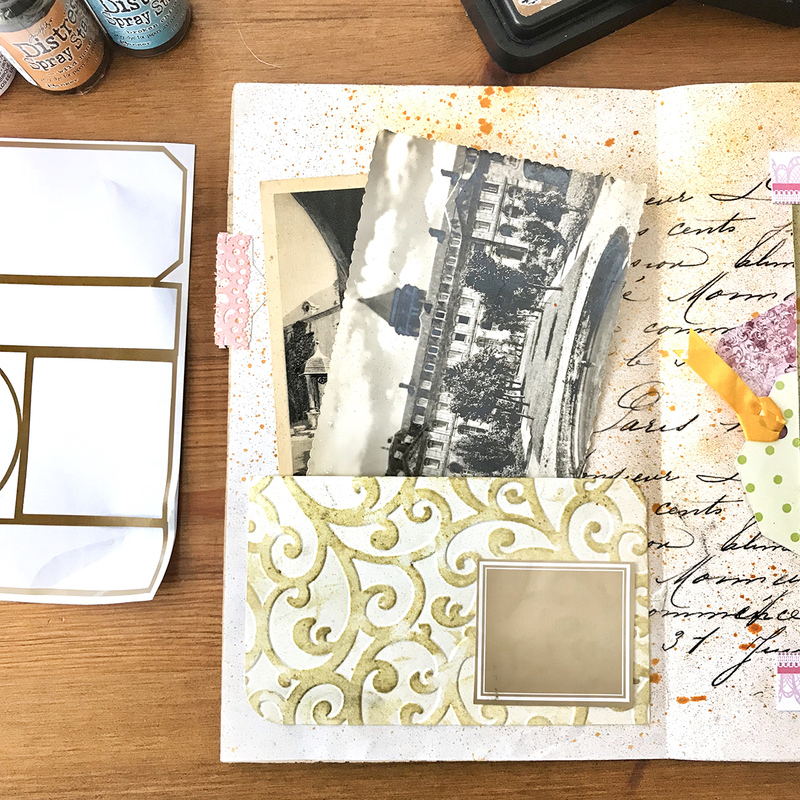 Ahhhh…This is a trick unto itself and a fun way to add bulk and more stuff to our junk journal. I will show you how I do this feat of magical mystery and slight of hand (or paper)! TEE HEE. Let’s learn how. We are not talking about 20% extra for a server here. 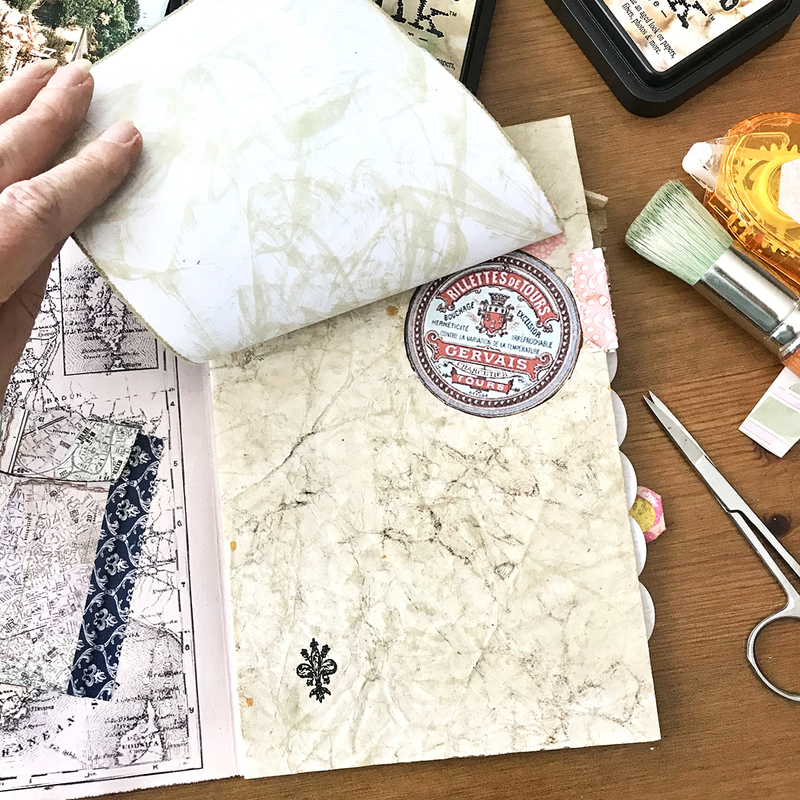 Tip ins are an fairly easy way to add extra pages to your junk journal. 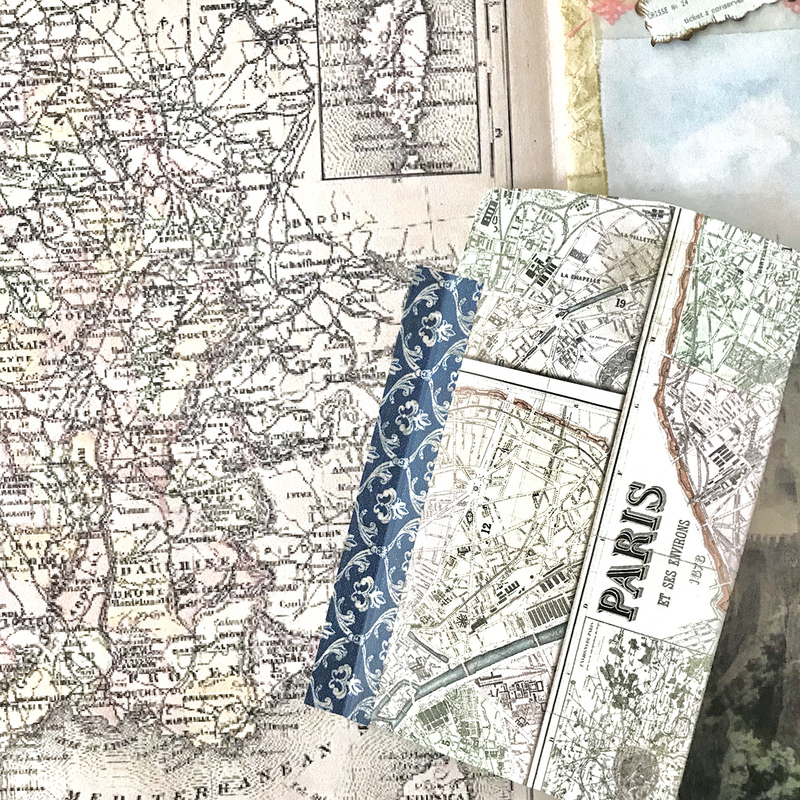 For our JJ3, I create a page (front and back) with the Map of France image that comes in two pieces. I glue the left side of the map to the right side to form two pages that become Page 33 and 34 of our journal. I left about a two inch piece of paper attached to the left side of the map (left image below). This will be what wraps or ‘tips in’ to the back page of this signature as you see in the middle photo. It is glued securely to Page 48 as seen in the right photo. This is called a junk journal tip in. 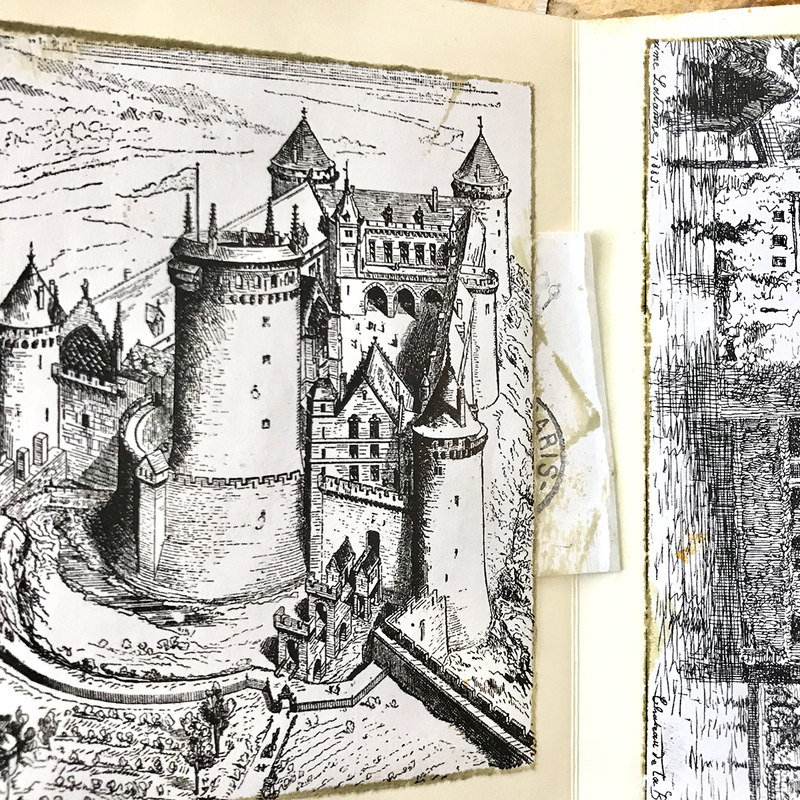 Once the 2″ flap is glued to the back page, we have ‘tipped in’ two new pages. Cool! The next tip in was discovered out of necessity. Page 35 and 36 were badly torn at the fore edge. 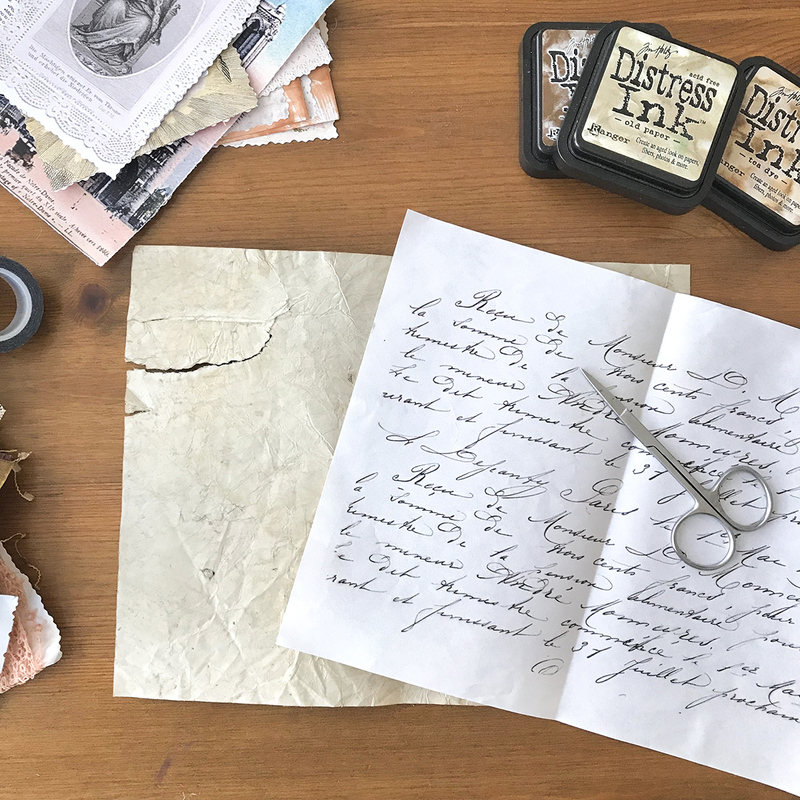 This happens with delicate, antique, and even some of your fragile stained pages. 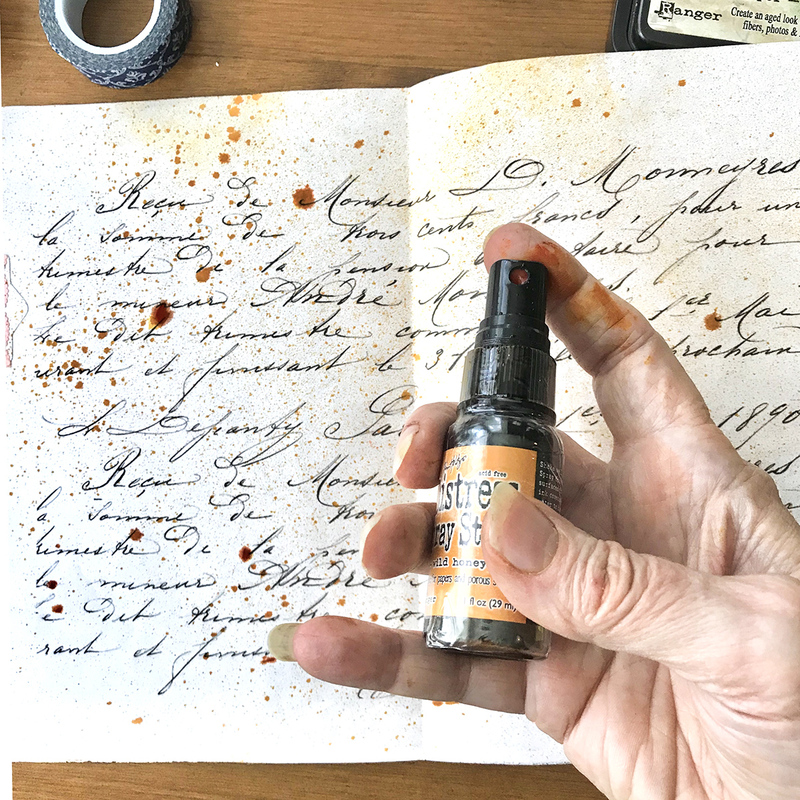 To remedy this, I simply glued to page 36 a folio size sheet of handwritten French text that I printed in landscape mode, leaving the right half of the sheet free. When folded at the center this side magically becomes pages 45 and 46. 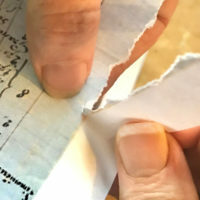 Another simple repair for a tear is to glue an element over the rip as I did with this circular ephemera on page 35 below. 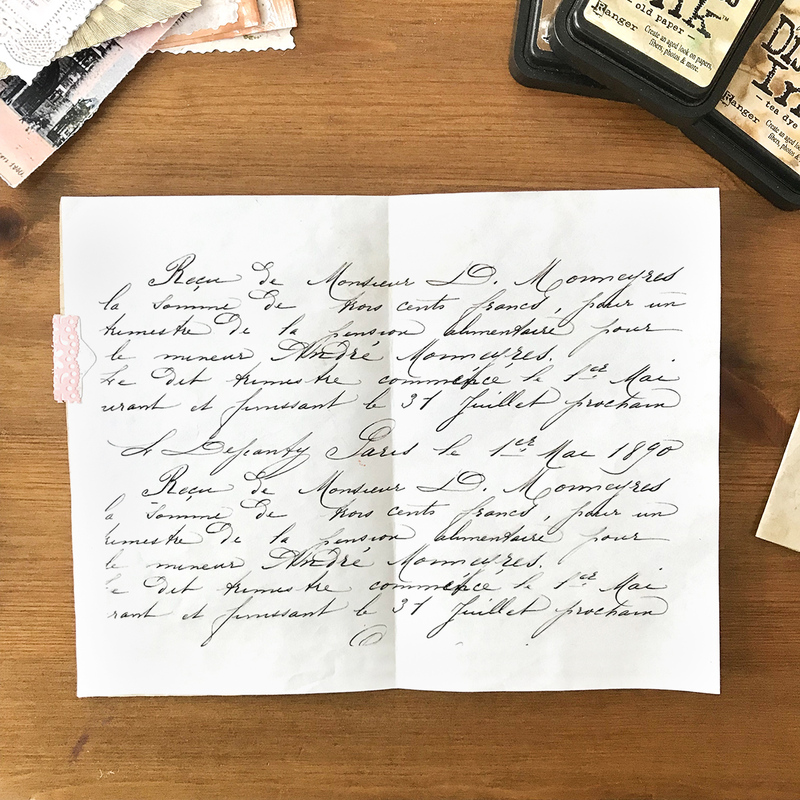 This reinforces the handwritten page glued to the back. 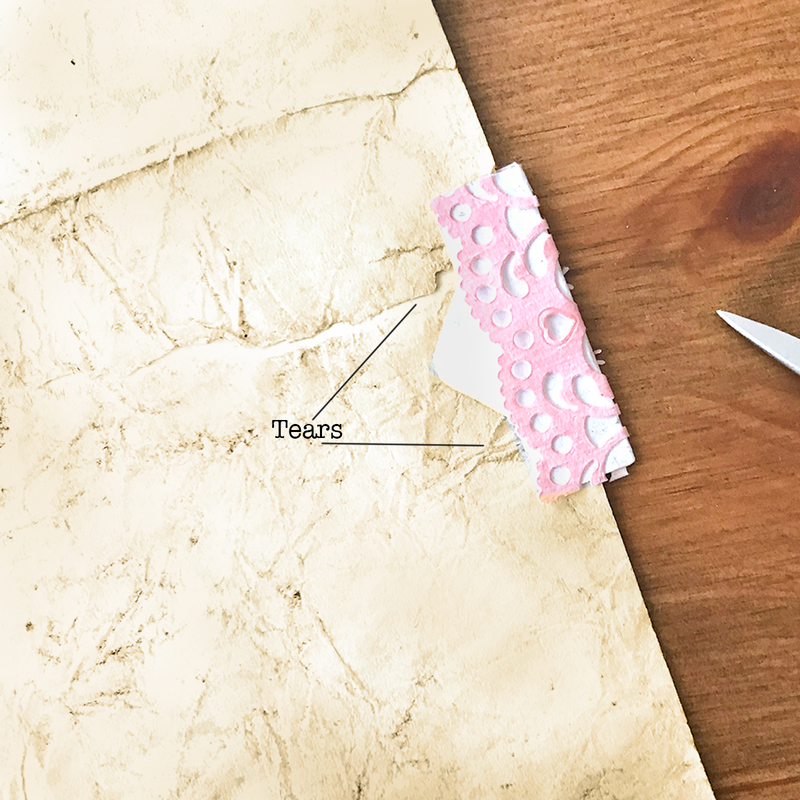 Hopefully, your pages are not torn and some of these ‘fixes’ will just be decorative! This flips outward for easy journaling as you can see below. The image at right is how the wrapped flap looks on the back and how it is attached to page 35. 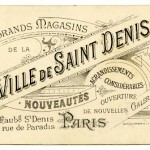 I used a stamp from my Cavallini French stamp set just to add intrest. A second type of Flap is on page 35. 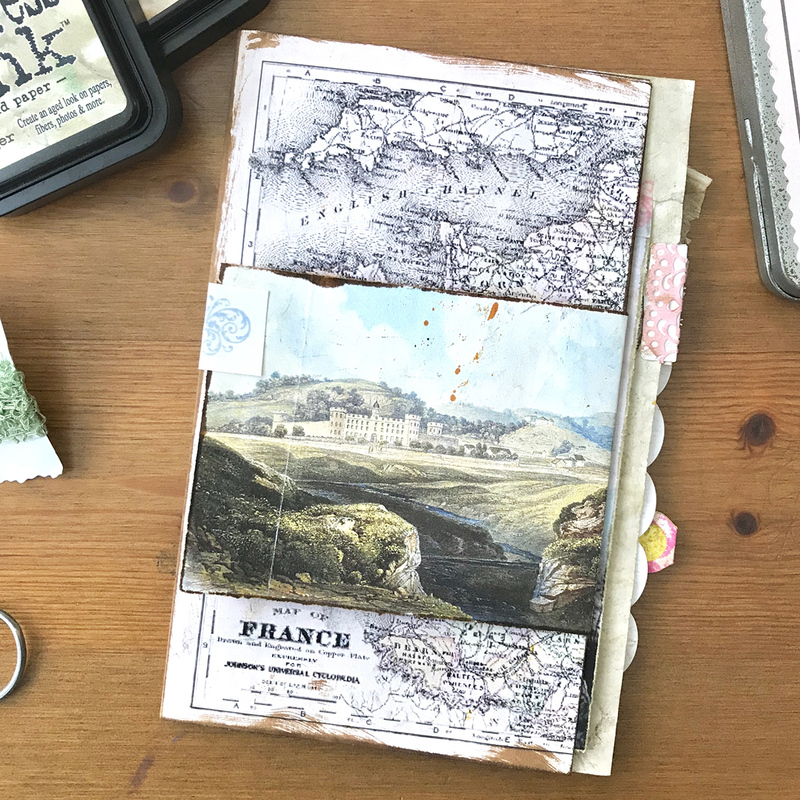 I used a nifty Map Coin Style Envelope Printable from a Graphics Fairy Premium Membership Envelope Kit that Karen and Emily are graciously allowing me to share with you. NOTE: The kits in the Premium site are amazing!! 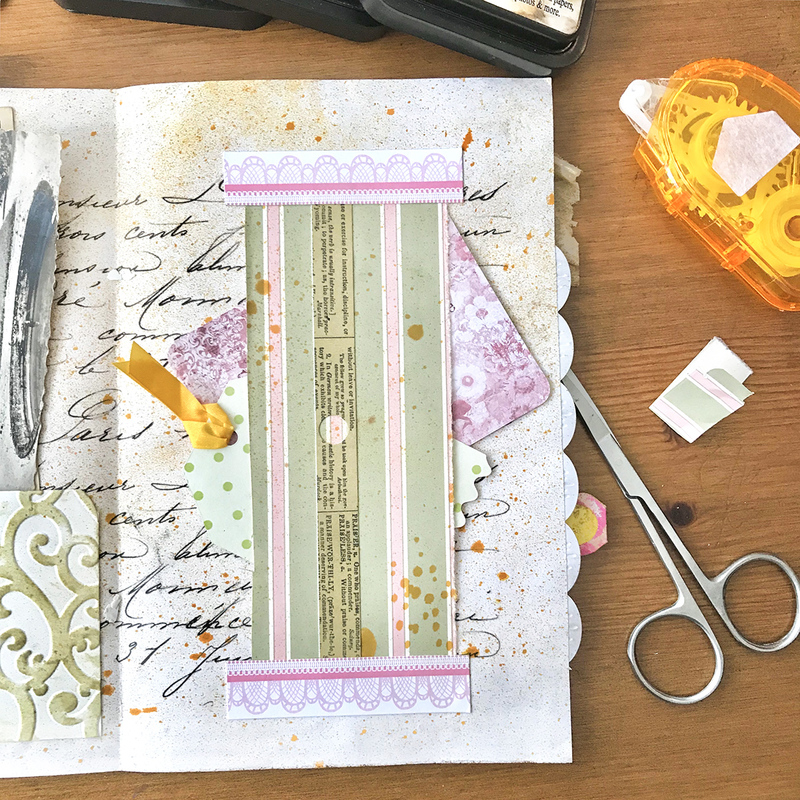 I simply glued the envelope together and added it to the page with washi tape on the front and the back, creating a hinge. This makes it a flap. Easy Peasy!! Also on page 46 is an interesting folded flap. 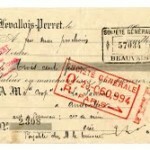 The long CAFES image was folded over itself to give texture and movement to the page. 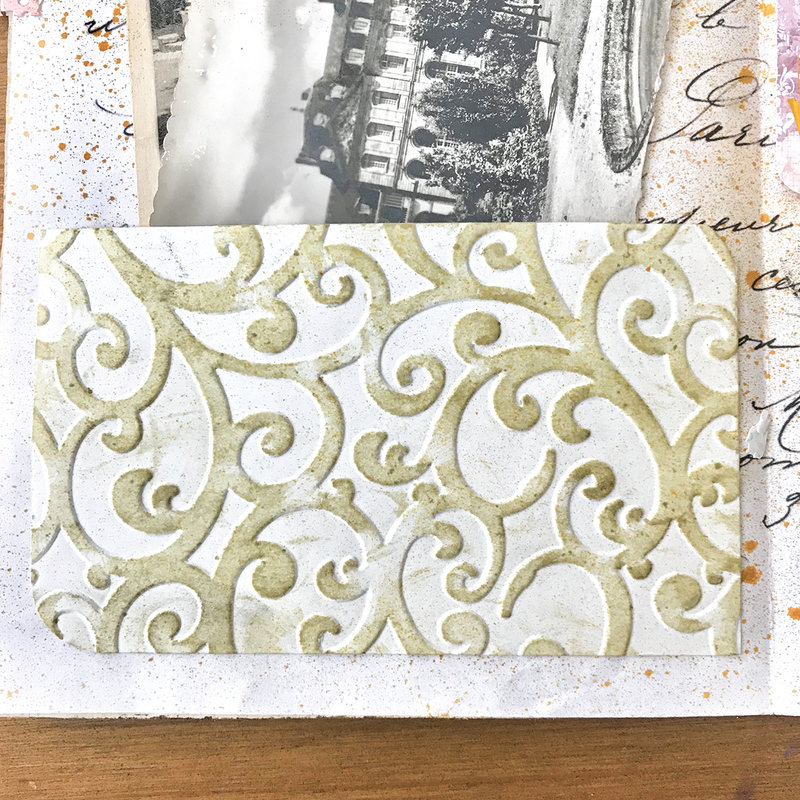 The focal point of Page 48 is a pre-made card blank from Anna Griffin from my stash (this one is similar). I turned it into a pseudo sketch portfolio as you will see in the Story section. This card has both a flap and a trap inside. Tabs are a fun element to add to the fore edge of any or all pages. Pages 35/36 and 47/48 were badly torn and needed stabilized. I wanted to cover the torn areas with tabs. 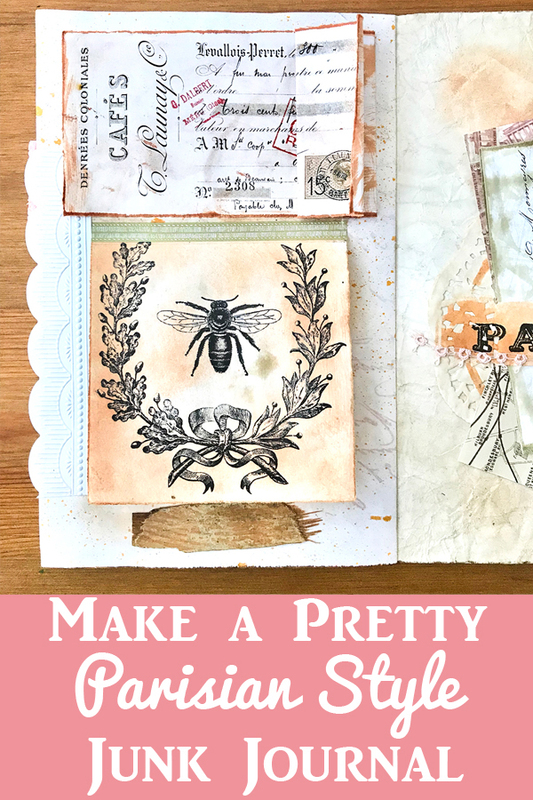 I cut tabs on my Cricut, but you can simply cut yours the same shape as mine or buy some lovely pre-made tabs. I sometimes find them at the dollar store. 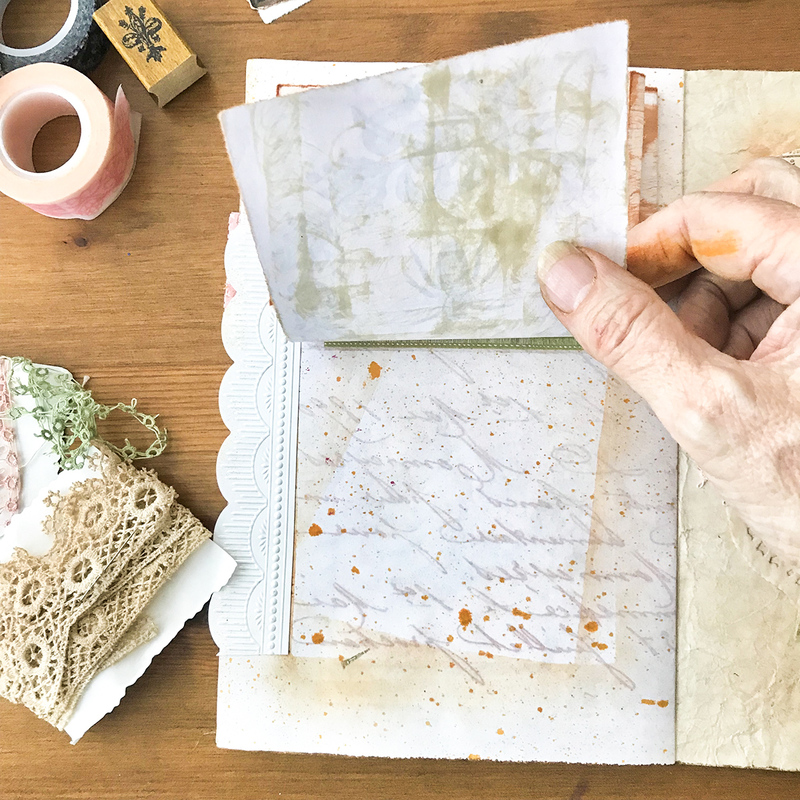 Just in case you didn’t guess already, the terms of this lesson are totally made up by me…except for the Tip Ins, which is widely used in junk journaling. Making Traps for ‘trapping’ little bits of stuff’ is just so cool. Page 45 has my Vertical Trap, which is simply a rectangle of printed and embellished cardstock attached to the page with adhesive border stickers at the top and bottom. Bits of collected memories are trapped underneath. 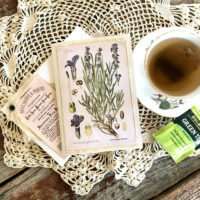 Page 47 has the Horizontal Trap created by stenciling a tab pattern on a tea stained doily then cutting two slits in the center as shown below. These are trap bits of paper, tickets, and notes. How fun is this technique?! Some things just happen as you work in a junk journal. You feel that a page needs a little something more and you improvise. That happened several times on these pages. 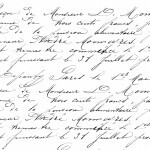 I loved the handwritten French page but it was way too clean and white looking. I needed to ‘vintage it up’ a bit after I had already attached it to the signature. OOPS!! So I used some Wild Honey Distress Ink Spray and that worked to add age after the fact. TIP: Spray outside or over a sink if you don’t have a spray booth!! It is messy. I have some embossed index cards in my stash. I usually create a bunch at a time so I have extras. 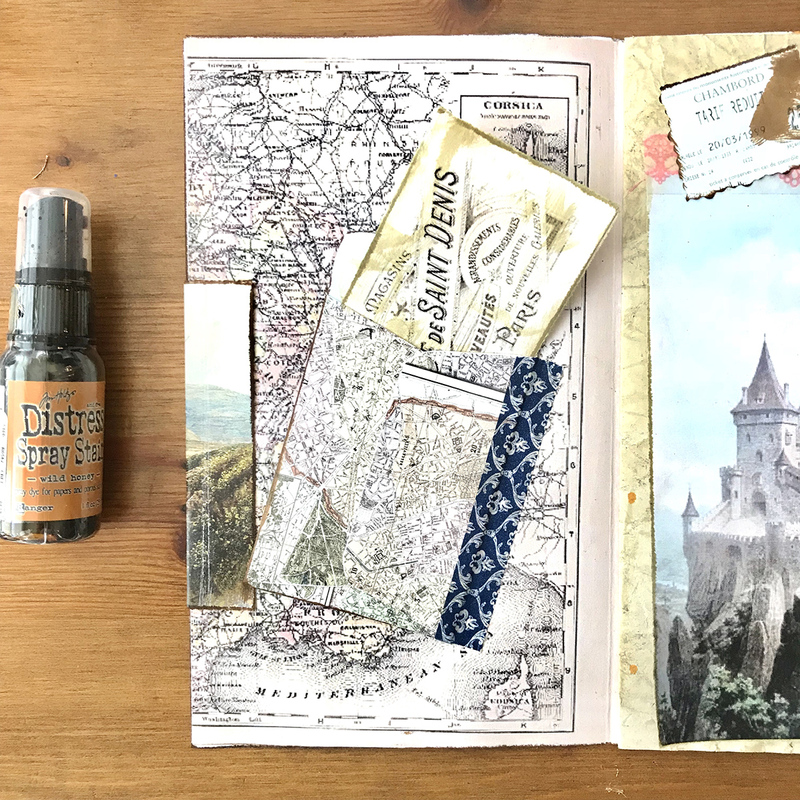 😉 I needed a pocket in this spread to hold post cards. This embossed card did the trick. 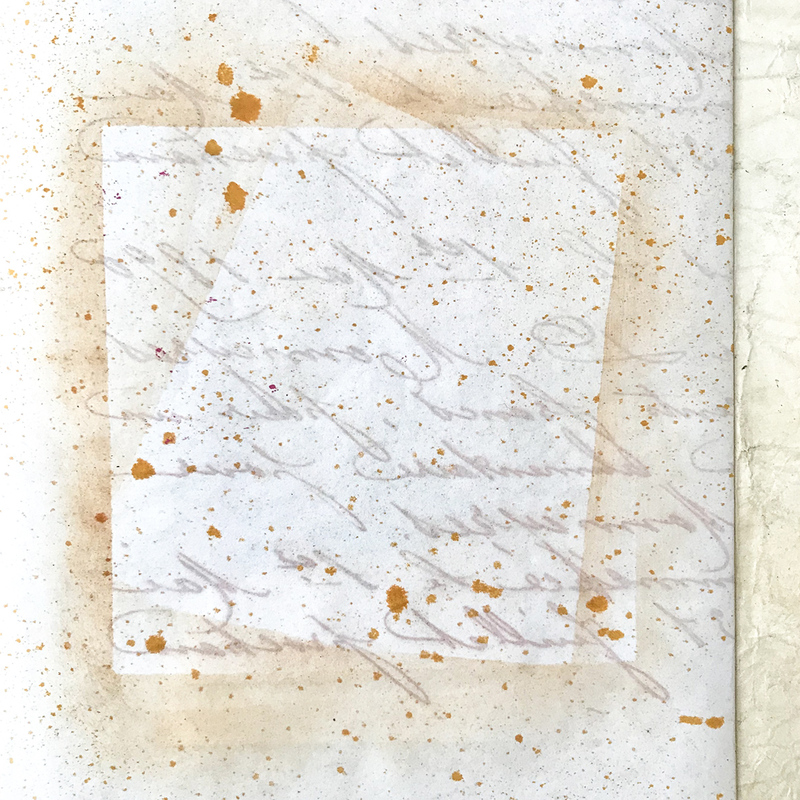 I just rubbed the Old Paper Distress Ink pad gently over the embossed areas to give it some color. Et Voila! I hate to waste anything. Paints and inks are part of that obsession I have to ‘use until gone.’ Additionally, this little trick helps clean the brush…a double score! 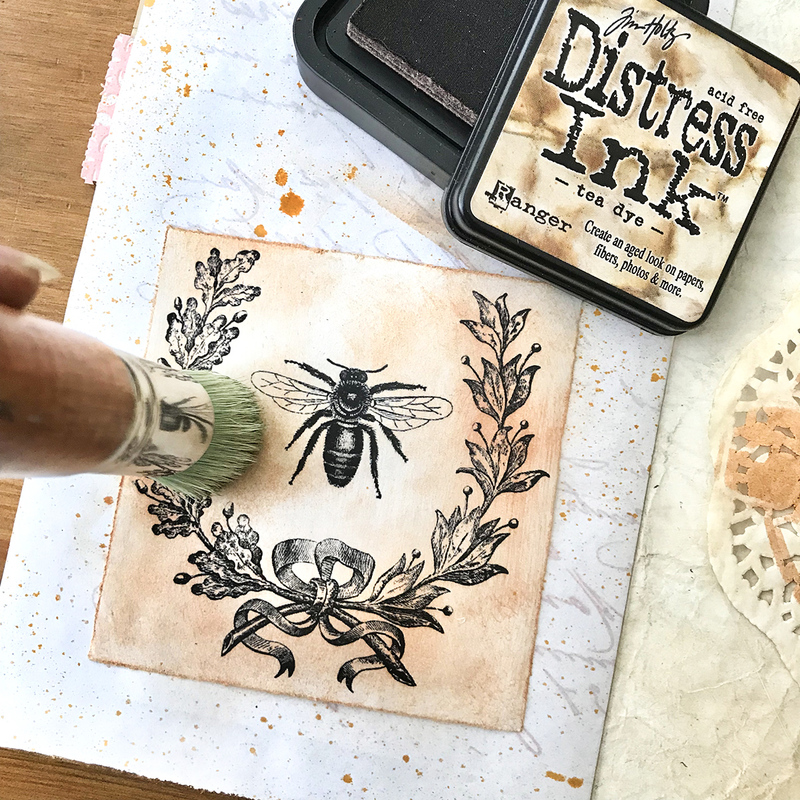 After I stenciled the doily in the Trap section above, I decided to use the ink remaining in the brush to age the bee flap. Something else, and fortuitous I believe, happened by chance as I rubbed the paint on the card. It created this wonderful crisp outline of the bee flap on the page it was attached to. 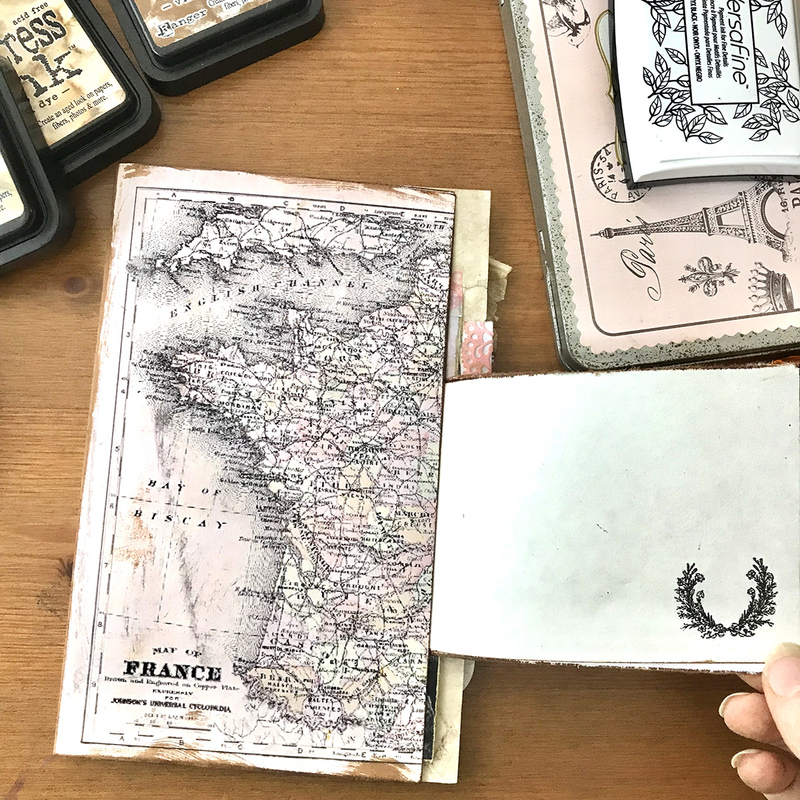 You can see that when you lift the flap just how cool the space is for journaling!! 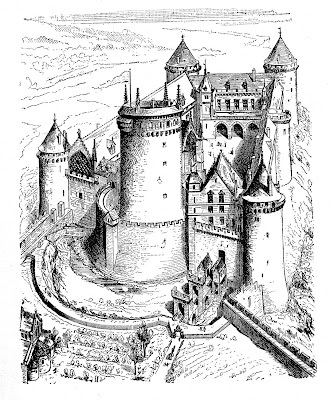 PAGE 33 – Olivia and her companions wanted to escape Paris for a while and tour some castles of France. 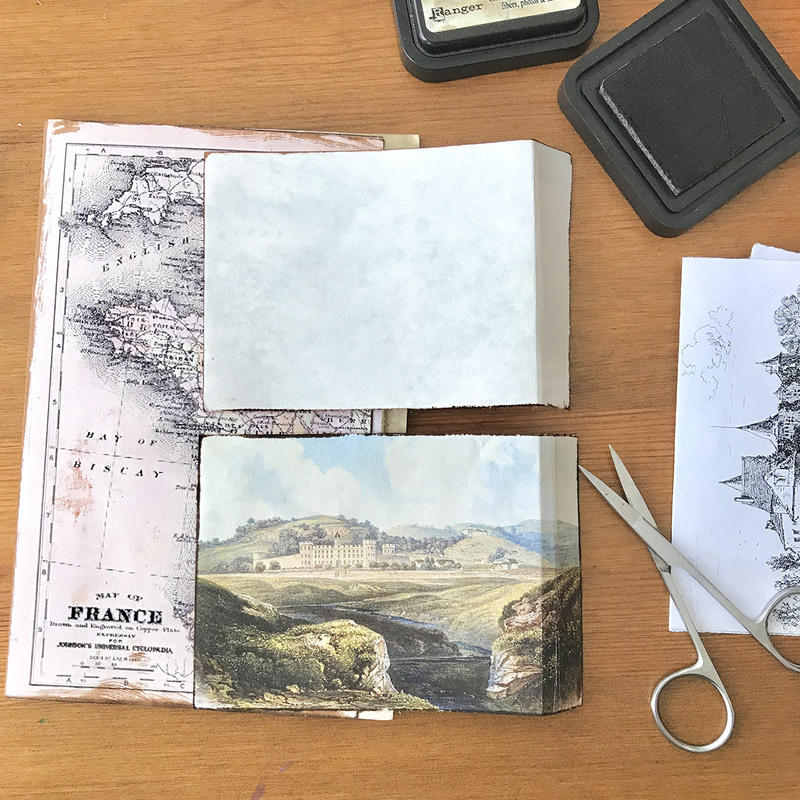 With map and sketchbooks in hand, they journeyed into the French countryside. 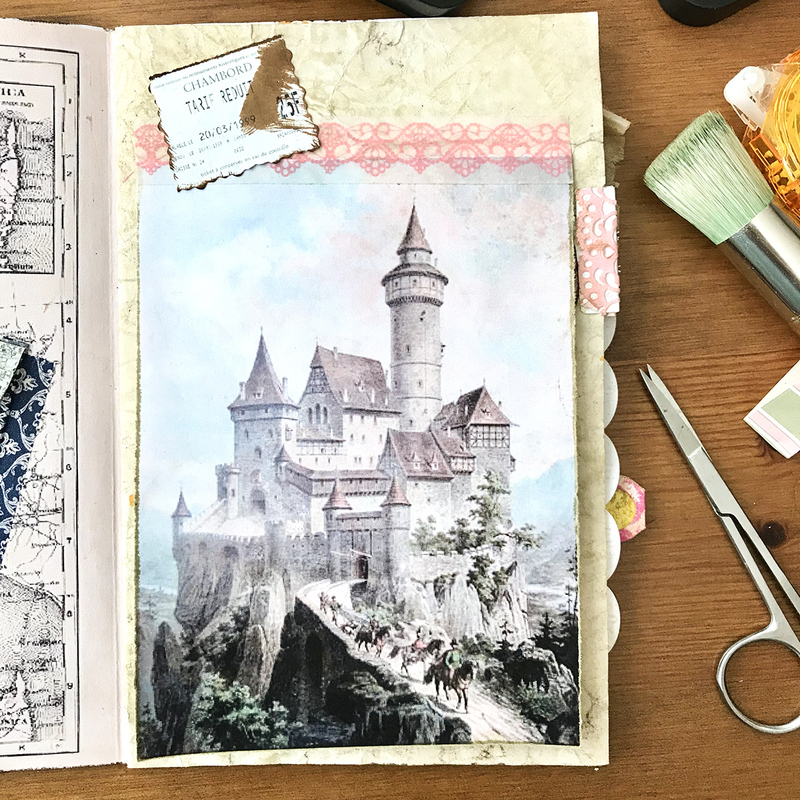 She created this journal page to remember her favorite castle. 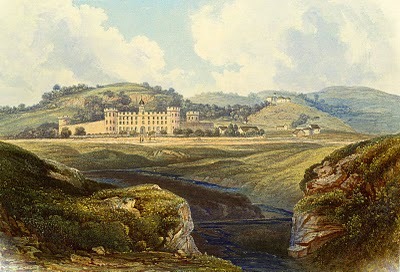 Look at those beautiful grounds and the stream. She attached a little tab at the top left of the flap to indicate that there is more to see if you open. 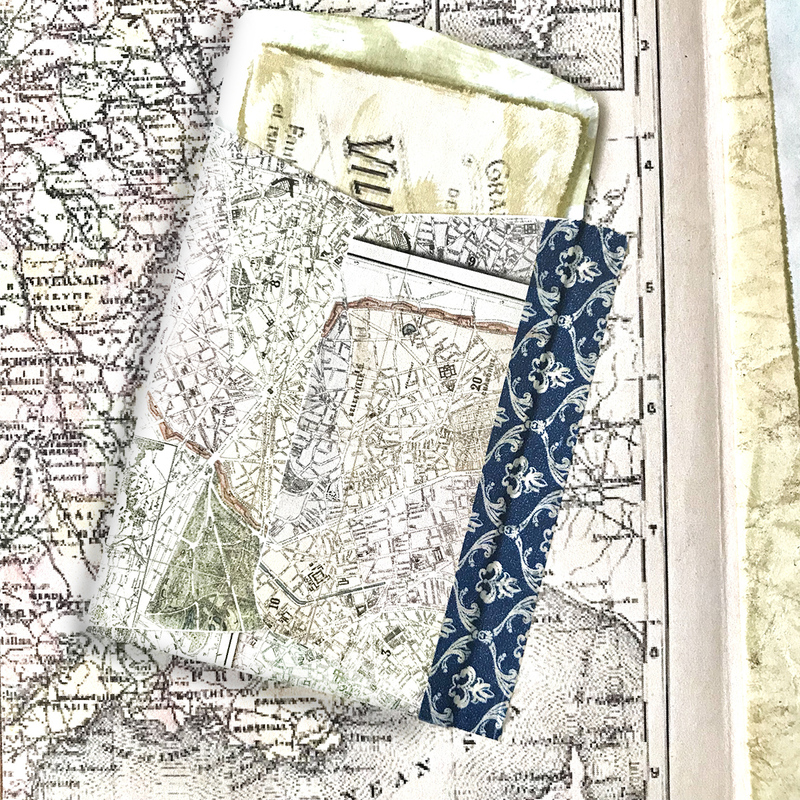 PAGES 34 – A tiny pocket created from her map holds a little souvenir. 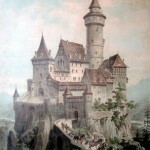 PAGES 35 – This castle was perched high upon a rocky hilltop. It was a long walk to see everything. 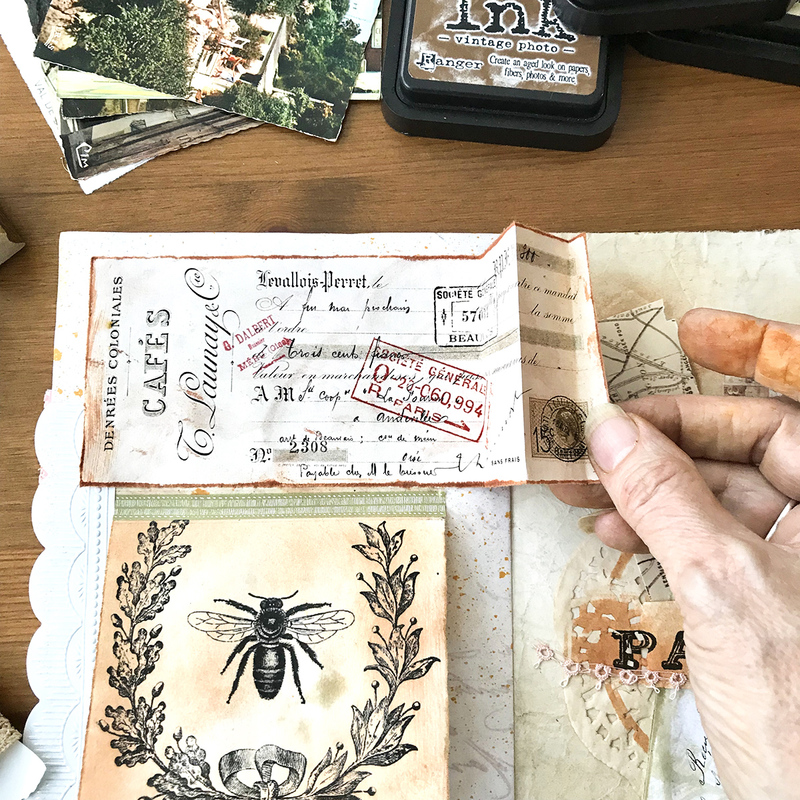 She attached her entrance ticket stub to the watercolor she created. Under the watercolor, Olivia hid a little label and left room to write her thoughts. 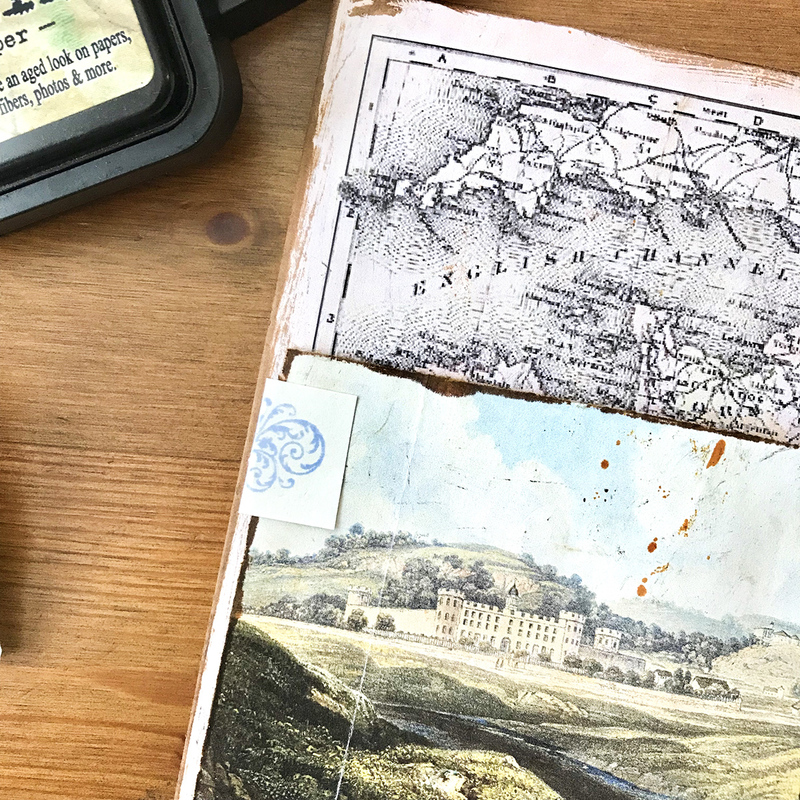 PAGES 36 – She collected plenty of postcards from the castles and tucked them in this lovely embossed pocket. 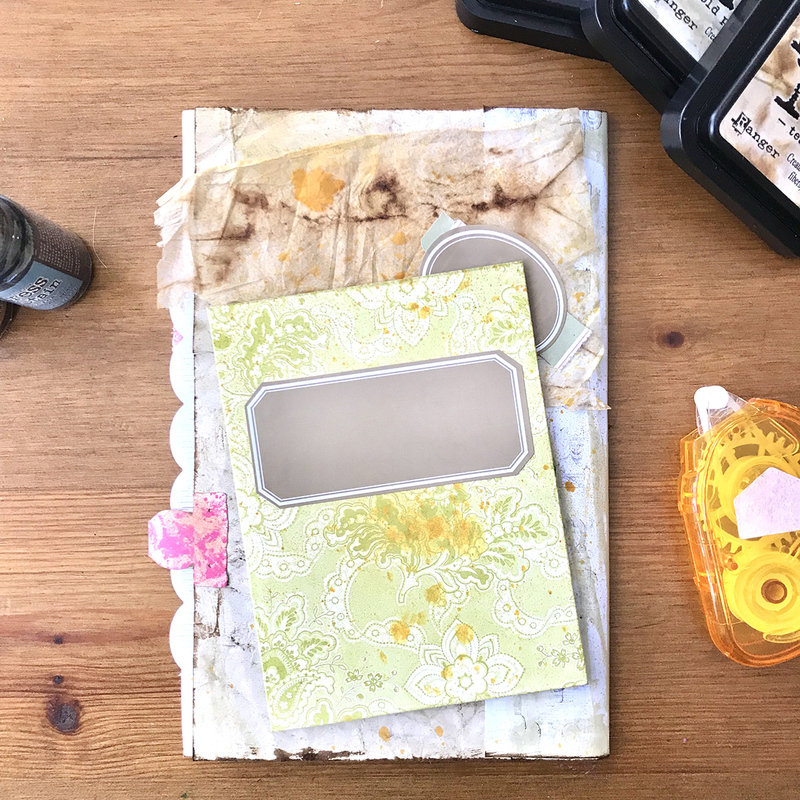 She found a packet of labels (Dollar Tree) that she will use to embellish other areas of the junk journal to give it a continuity of look and feel. PAGE 45 – Tickets, tags, and fave candy packages need a place to rest. This vertical space is just perfect. 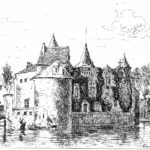 PAGE 46 – Olivia has fallen in love with the French Bee symbol. She is going to make needlepoint seats for her dining chairs when she returns home. She especially loves this design (created by Miss Karen). A cafe receipt and a little chip of wood she found complete the texture on the page. 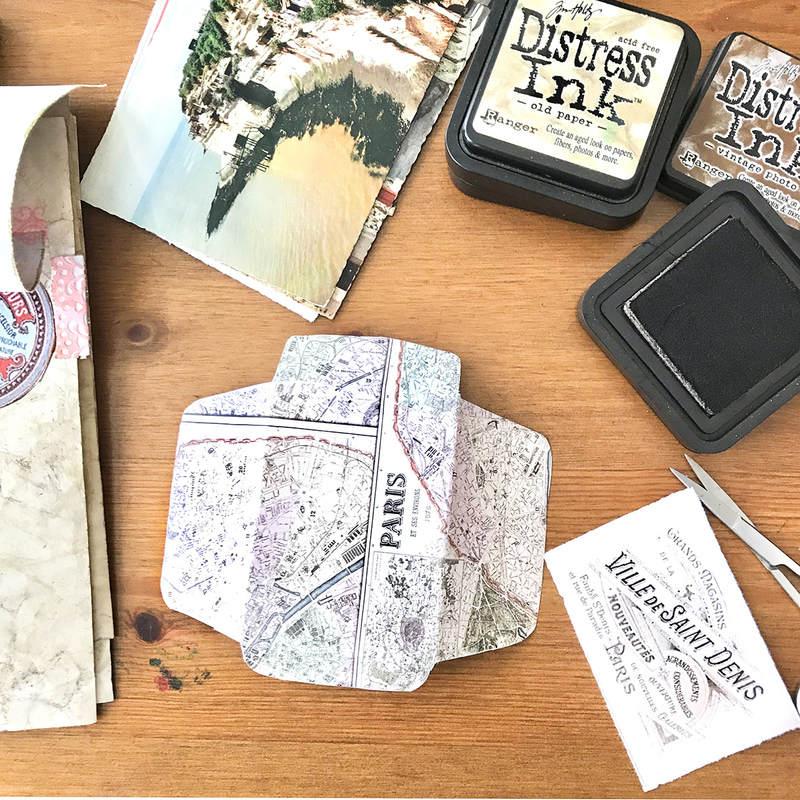 PAGE 47– A little love note, a piece of a map, and a candy wrapper are held in place on this lovely stenciled doily trap. A tiny pit of lace from her dress adorns the trap. The trap is stamped PARIS for extra pizazz. PAGE 48 – Olivia loves to sketch in charcoal. 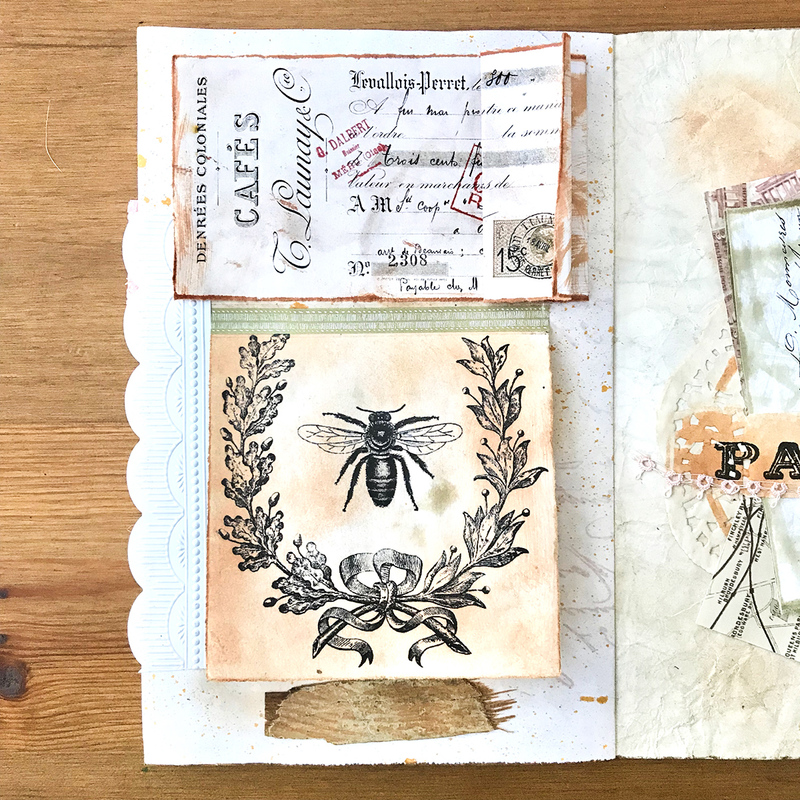 This little card flap opens to reveal two of her sketches from the trip into the country. A tea bag adds texture to the top of this page. Her sketches are just amazing, aren’t they? 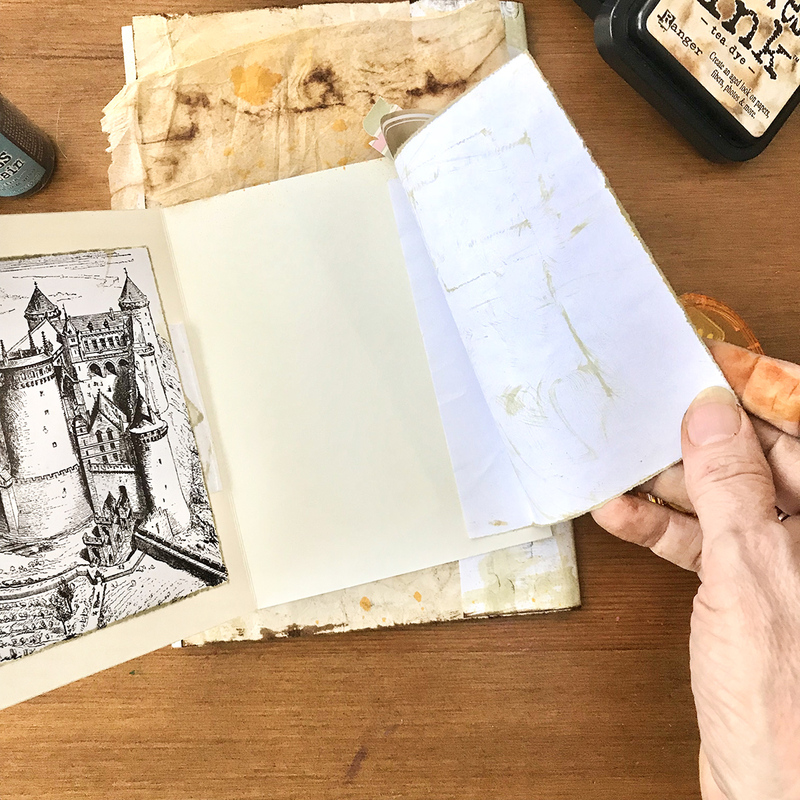 The right sketch flips open to reveal a journaling space. The left sketch traps a little bit of ephemera that she doesn’t want anyone else to see. 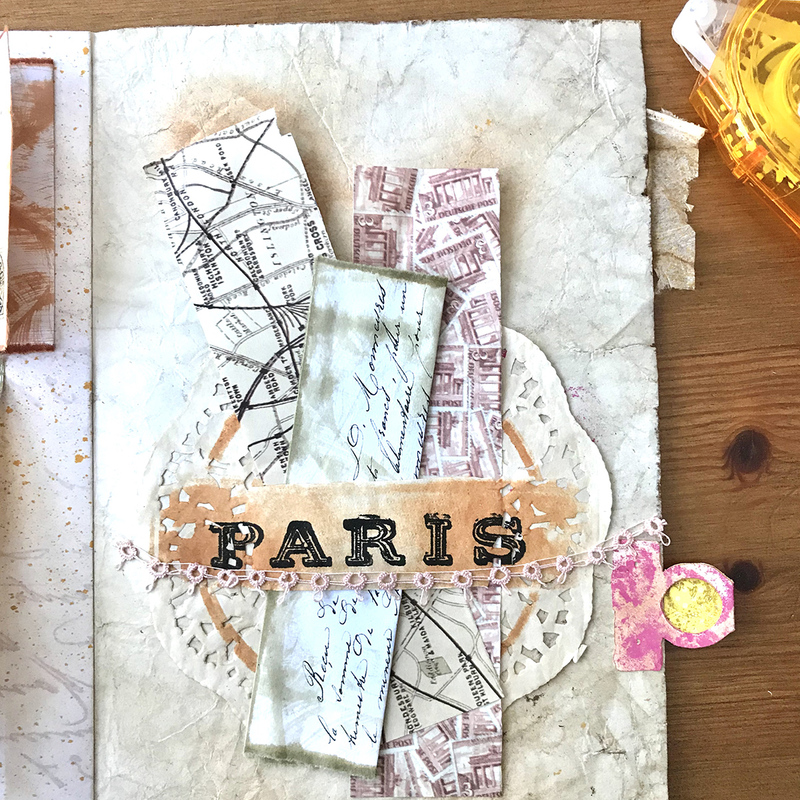 It was amazing visiting the French countryside this week as we learned some new techniques, tips, and tricks to help you create the very best of junk journals. It should take you no more than a few hours to complete the pages. We have two weeks until our Pages Layout 6 (can it be?) 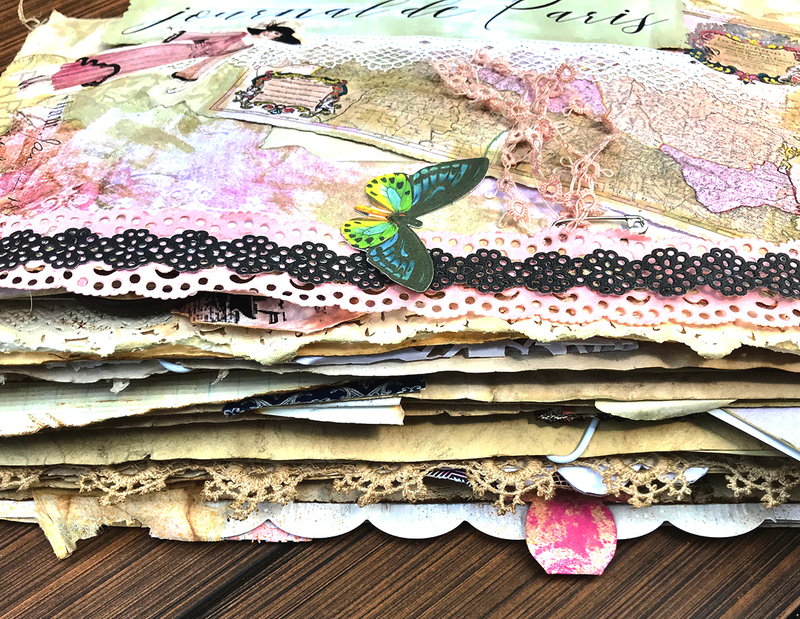 tutorial goes live, so you have plenty of time to complete your Junk Journal Page Layouts. It has been a joyous Summer for me leading this journey. I hope it has been so for you too. Here is your assignment. Complete eight pages in your third signature using the above techniques. You will have four single pages, which will be Pages 33 through 36 and 45 through 48. 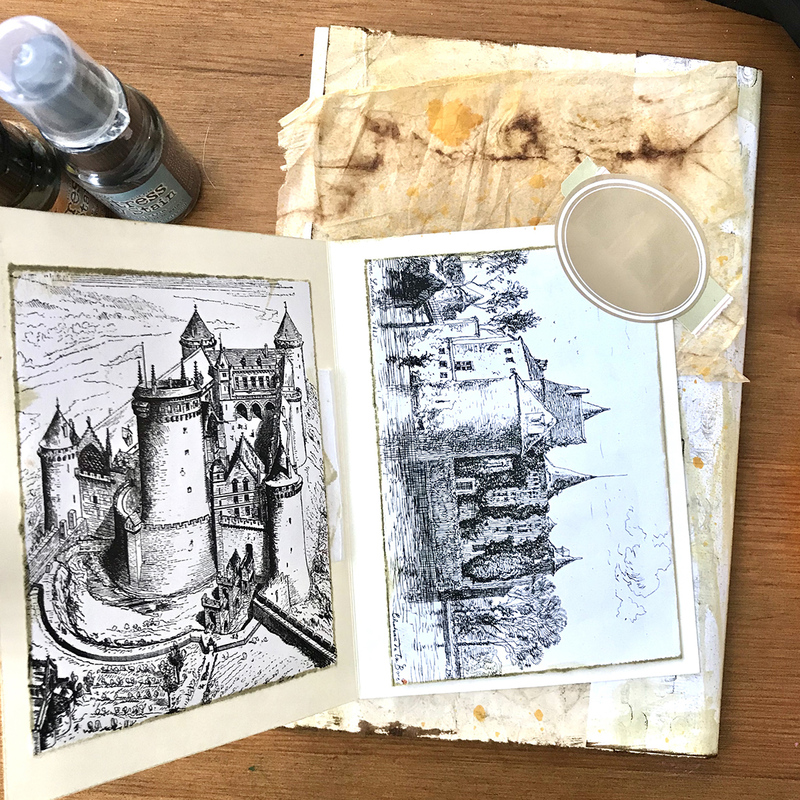 You can create your own pages using your imagination or you can duplicate mine as closely as possible. Remember there is NO ONE WAY or RIGHT WAY!!! Just have fun! Optional: Create your own story if you like. 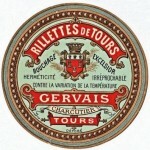 In the next tutorial we will be using what we have learned as we explore Notre Dame and Versailles. Oh joy! Please join me in Page Layouts Six soon. « Beautiful Old Singing Speckled Bird Image – Thrush! 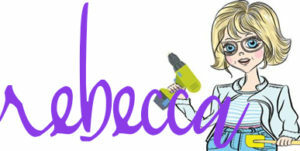 This course has been amazing, Rebecca! I look forward to binding it all together. 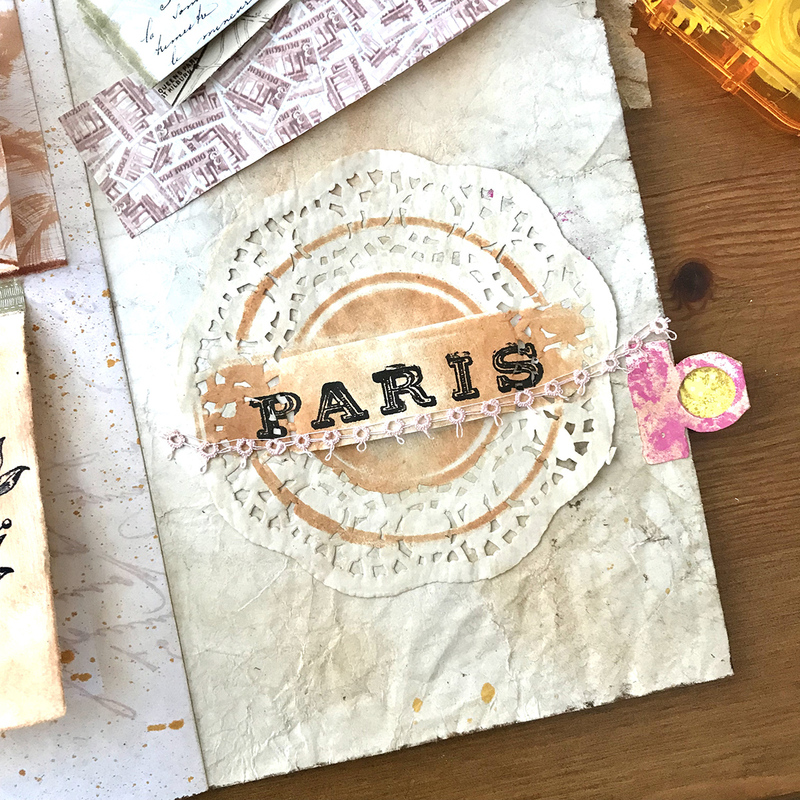 You have such fabulous ideas and the graphics from The Graphics Fairy are simply gorgeous – especially when embellished and aged like you’ve teaching. Oh my, I am loving this tutorial. I just copied all of it to start following and cannot wait till the tourist season is over here in Alaska (I’m a driver/tour guide) in 3 weeks or so and I can get back to working on journals. This will be the one I want to work on first…lovely!! Oh how exciting Patricia, I’m glad you’ll be able to get back to your journals, enjoy! Thanks so much!! Hey is lesson 6 up and I’m just not seeing it? Wonderful techniques! I keep forgetting I have those embossing folders, and this is such a great use for them. Have enjoyed this series so much. Am looking forward to the rest of them. Thanks so much Heather, enjoy!